Today’s recipe, like many of the previous yeast recipes I’ve posted here, comes from my 1973 Better Homes and Gardens bread cookbook (In case you’re wondering, I bought it on Ebay…I wasn’t even born in 1973!). I love this no-fuss, down-to-earth bread book. 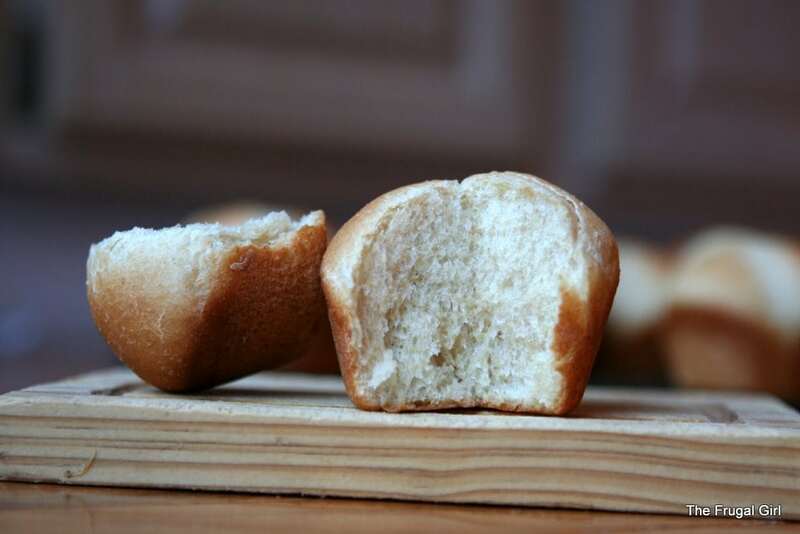 If you’re looking for something hearty and a little more nutritious than regular dinner rolls, this is a recipe for you. We like to eat these with dinner, but leftover rolls are also tasty at breakfast and lunch. My kids like to split them open and spread butter and jam on them, or sometimes peanut butter, but they’re also good with more savory toppings like lunch meat, cheese, or chicken salad. A combination of whole wheat and white flour is used in this recipe. Though you could use nothing but whole wheat flour, the resulting rolls would not be as fluffy or soft as those made from a combination. So, if you have reluctant whole wheat eaters at your house or if you are a new baker, I highly recommend sticking with the proportions specified in the recipe. This recipe, like many of my others, starts with a combination of flour and yeast. 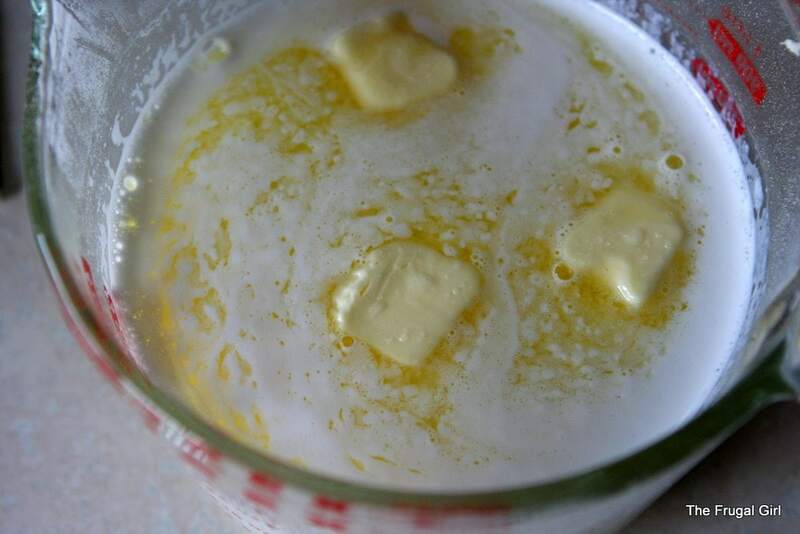 Combine the milk, sugar, butter, and salt together, and heat to 120 degrees F. The recipe calls for 1/2 cup of sugar, but you can use less if you prefer, and you can substitute honey. Add the milk to the dry ingredients, add 2 eggs, and beat for three minutes. 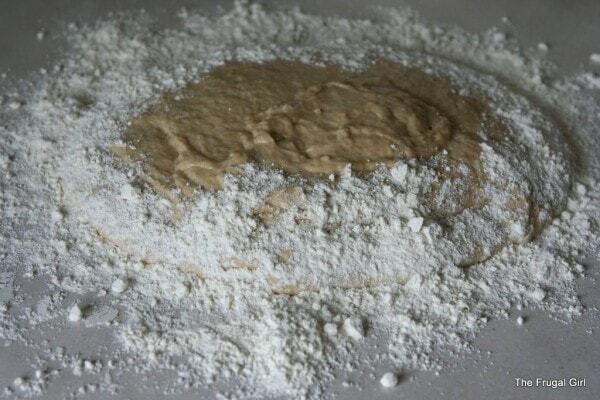 Add enough all-purpose flour to make a soft but kneadable dough. I kind of misjudged how soft my dough was this time around…I would not recommend trying to knead dough that is this gloppy if you are a beginner baker! When I screw up like this, though, I just sprinkle some flour all around the dough and use my bench knife to help me knead until the dough is more organized. It’s soft enough that after it sits for a moment or two, it flattens out some. By the way, I only have white wheat on hand at the moment, as opposed to hard red wheat, so I used that when I ground the flour for this recipe (I have a grain grinder that I use to make all my whole wheat flour). Because of this, my dough looks a little lighter than it would if I used regular whole wheat, so don’t worry if your dough is darker in color than mine. Put the dough back into the mixing bowl (I don’t even bother to wash mine), cover with wet tea towel, and let it rise in a warm place for an hour, or until it’s doubled in size. Punch the dough down and divide it into 36 pieces. If you prefer for your rolls to be a little larger, you can cut the dough into 30 pieces. You can shape the dough however you wish, but here are three suggestions. To make cloverleaves, cut each dough piece into 3 pieces, shape each piece into a ball, and place three into each cup of a greased muffin tin. 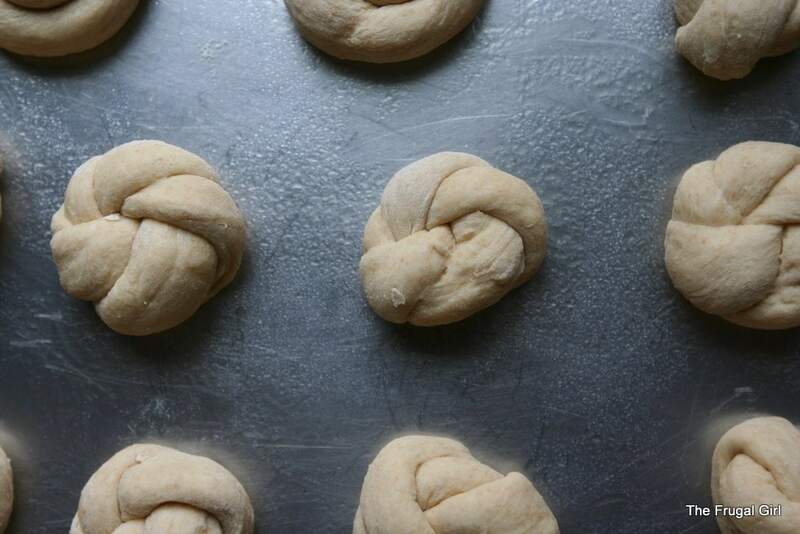 To make rosettes, roll each piece of dough into an 8-10 inch rope and tie a loose knot. Tuck one end of the rope into the middle of the knot and tuck the other end underneath the roll. 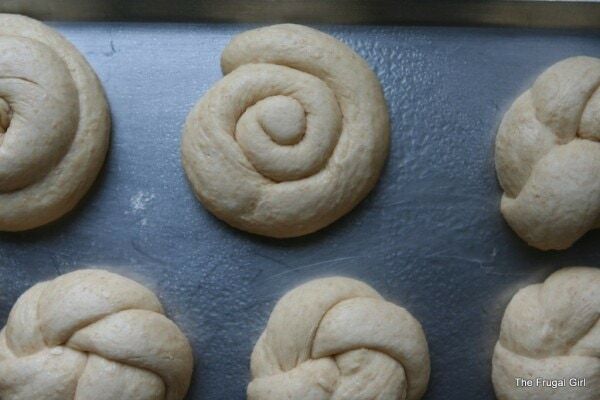 To make swirls, roll each piece of dough into a 8-10 inch rope, and coil the strand into a snail-like shape. Cover pans with a wet tea towel and let the rolls rise for 30-40 minutes, or until doubled. Bake in a preheated 350 degree oven for 15-20 minutes, or until lightly browned. I highly recommend eating them warm from the oven, spread with butter. Really, I think that’s the best way to eat any bread! 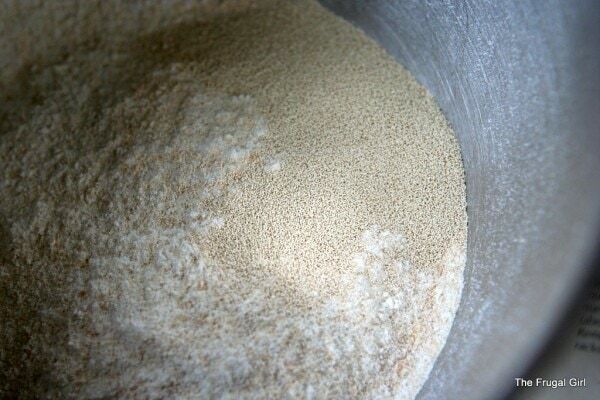 In a large mixer bowl, combine whole wheat flour and yeast. Heat milk, sugar, butter, and salt together just till warm (115-120 F). Add to dry mixture; add eggs. Beat at low speed until combined, then beat at medium speed for 3 minutes. By hand, stir in as much of the all-purpose flour as necessary to make a soft, but kneadable dough. 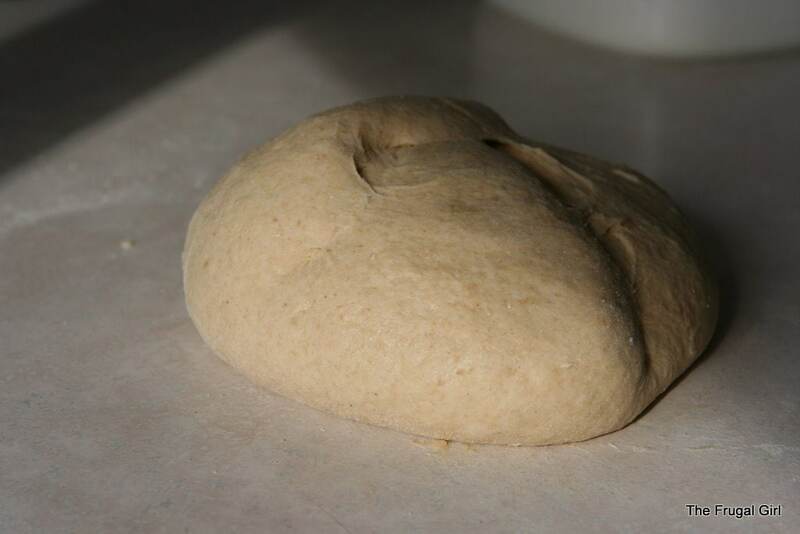 Turn out onto a floured counter and knead for 3-5 minutes or until smooth and elastic. 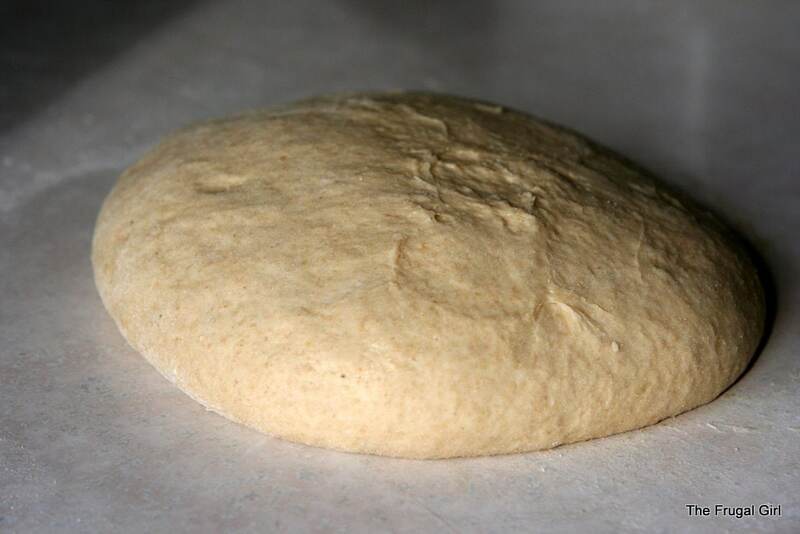 Place the dough in a bowl, cover with a wet tea towel, and let it rise in a warm place for 1 hour, or until doubled. Punch dough down. Divide into 36 pieces. To make cloverleaves, divide each piece into 3 pieces, shape each into a ball, and place three balls into each section of a muffin tin. To make rosettes, roll each piece into a long strand, about 8 inches long. Tie into a loose knot and tuck one end into the top of the roll and one end under the roll. To make swirls, roll each piece into a long strand, about 8 inches long. Coil the strand into a snail-like shape. 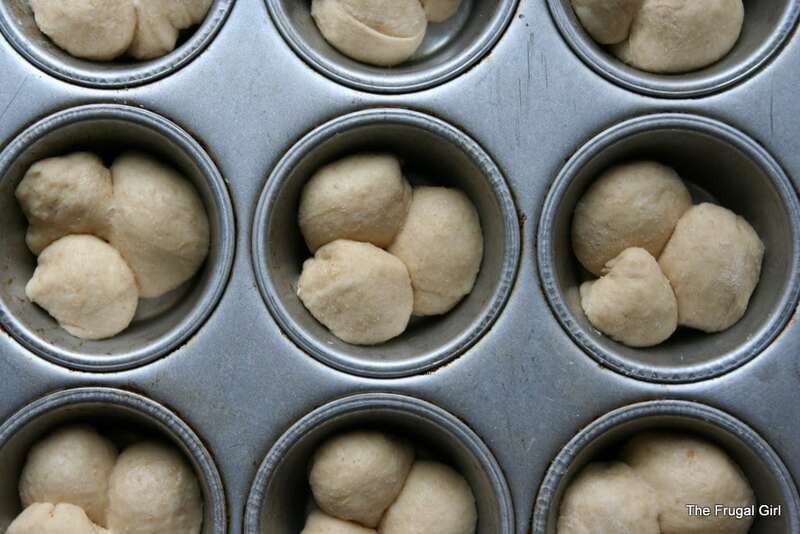 Cover rolls, let them rise for 30-40 minutes, or until doubled, and bake in a preheated 350 degree F oven for 15-20 minutes, or until lightly browned. Cool on wire rack. Hi Kristen! These look lovely! Two questions – the temp on the liquid mixture is much higher than usual, 120 versus the average 105 – 110. Any particular reason other than that’s what the directions said? Visual learner that I am, pictures of the rosette process would be helpful. I’m trying to mentally visualize the process and failing miserably. Might just have to find some play-dough and figure it out before my next baking project. 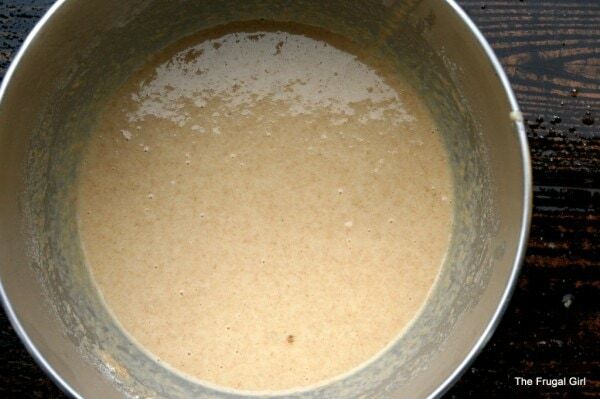 Ah yes…yeast recipes that combine the liquids directly with the yeast usually call for a temp of 105-110, but recipes that combine the flour and yeast before adding the liquid usually have a higher temperature. I just made this recipe today for the first time and got rave reviews! Awesome stuff!! I need a muffin ton for some other recipes and they may come in handy for these…. I’m sure you probably know this, but if you add 1 tsp of gluten per cup of flour, you can get just as fluffy yeast breads as if you used a combo of white and wheat flours. These look yummy. Thanks! Looks soooo YUMMY!! I have been trying a few of your other bread recipes. I need some more practice but they are all really great. I couldn’t wait to see what you had posted this morning! Thanks for all your insight! These rolls look wonderful! There’s just something comforting about fresh yeast bread warm from the oven. My Great Aunty Mary made wonderful yeast rolls almost every week. Later on in life as she began to experience health problems, she started to use whole wheat flour. I clearly remember her setting the covered pan of rolls on the hot water heater behind her kitchen door so they would rise. Great memories. Yesterday was my birthday and my husband (in true frugal fashion) bought me one of those 70’s Home and Garden breadmaking books. Just last night we were talking about all the different ways bread can be shaped. What a coincidence! Kristen I ran across a great Focaccia recipe last week. It is SO simple I thought klutzy cooks who read your site might like it! LOL – I adore your photos and baking and wish I had time to create the masterpieces you do! Combine dry ingrediants. Combine water and olive oil then mix wet ing and dry together. 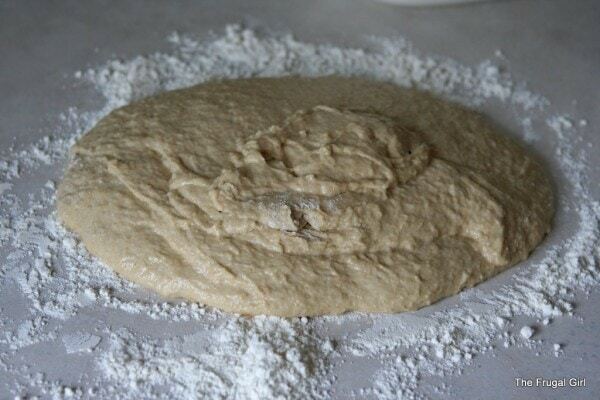 Mix dough and then turn out on floured surface to knead. Grease bottom of 9×13 baking dish and press dough into dish with oily fingers (chuckle) Bake for 20 minutes at 425. Remove from oven and sprinkle with cheese, or herbs. Cook for another 5 minutes. Can’t tell you how delicious this is or how much I enjoy reading your wonderful recipes! Oh my, those look delicious! *adds to RECIPES TO TRY folder* Thank you for sharing! ps. love your site ! YUM!! Can’t wait to make them! Your breads are beautiful! 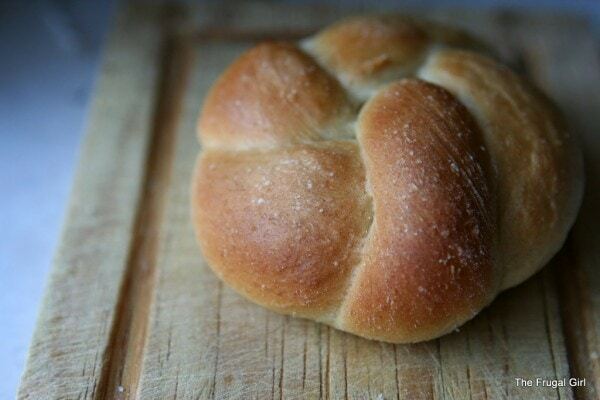 My mother made Butter Horn Sweet Rolls regularly. I made them about 20 years ago for a family gathering and my brothers immediately recognized that it was not mother that made the bread. I haven’t taken them to a family gathering since! I think I need to get her recipe out and practice again as my bread making skills have much improved from 20 years ago. I made these last night as loafs of bread. So good. they rose so well. I do find that I use less flour then you do. If I use what you suggest my bread is hard as rock. These ones turned out fluffy and rose well.! I just want to thank you for sparking my interest in baking. I have tried several of your recipes over the last couple of days and I have to say that the Whole Wheat Bread With a Twist(a quick and easy twist) was the best (not including the brownies and texas cupcakes)!!! I am so glad I was watching television the day you were on!! I am going to start making more foods from scatch…they taste soooo much better than store bought and I know what is in the foods I am preparing!! Again, thank you from my entire family!!! Thank you so very much. I made a homemade sausage soup last night for dinner and invited my parents to join us. I also made your wonderful roll recipe above! It was all a hit! Thanks so much for the pictures and all – what a great help to this kitchen-challenged mom! Oh my gosh! These are great! I need some work tying the knots, but they are beautiful and delicious for sandwhiches. I also just tbaked your white sandwhich bread, which I will put in the freezer until next week. They look beautiful! So far everything I tried from your blog has worked out wonderfully. Thank you so much! I can’t wait to try more and now you are posting about painting furniture, something I was going to tackle this summer. Your blog is awesome! Oh, these were YUMMY. Tried them, loved them. Thank you. Made these today and took half to our Ladies Soup & Salad supper at church. They were a HUGE hit and went marvelously with Lemon-Pepper Chicken Soup. Everyone was so impressed with the rosettes – thanks for a great tutorial, you make it so easy to do this! These look good! Plan to make some and toss the extra in the freezer. I love my freezer, it’s changed the way I shop for groceries. I have a question about substituting soy milk in the place of cow’s milk. My husband and I both have lactose issues and only ever buy soy milk. Have you ever tried baking with soy milk? Are the results the same? I’m loving your blog. I was homeschooled like you and also plan on homeschooling my own children (when I have some). Reading your stories has brought me to a greater appreciation for my own mom and her cheerfully frugal approach to cooking, housekeeping, and raising children. Power to the Moms!! I made these to go with soup last night and they were great! Thanks for the recipe. I have ever been fearful of yeast but I was craving rolls for Sunday dinner. I found your site on a random google search and I am in love. The rolls were super easy and turned out beautifully. Thank you for the tips, for the pictures (your explanation of when to stop kneading was the best I’ve ever heard). Thank you. My 7 year old and I made these tonight and they turned out fabulous! Soft, yummy and very filling! @Amanda — I just made these with soy milk (but sow’s milk butter) and they came out great! I made these rolls, but when I took the towel off, it stuck to the rolls. So, they actually turned out to be whole wheat flatbread rolls. What did I do wrong? That usually happens if they’ve over-risen. If you’d like to try again, you can use greased plastic wrap, or you can put your rolls in a turned-off oven with a bowl of hot water on the bottom of the oven (that will create a humid environment). I made these tonight and they were delicious! I used only whole wheat flour and they turned out great – not too dense. 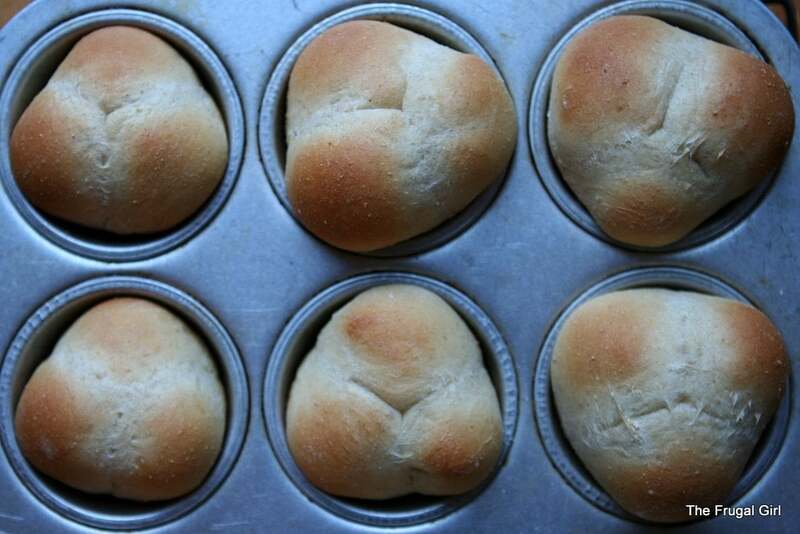 great, easy wheat rolls. thanks for the recipe! These were FANTASTIC! Thanks for the great directions. 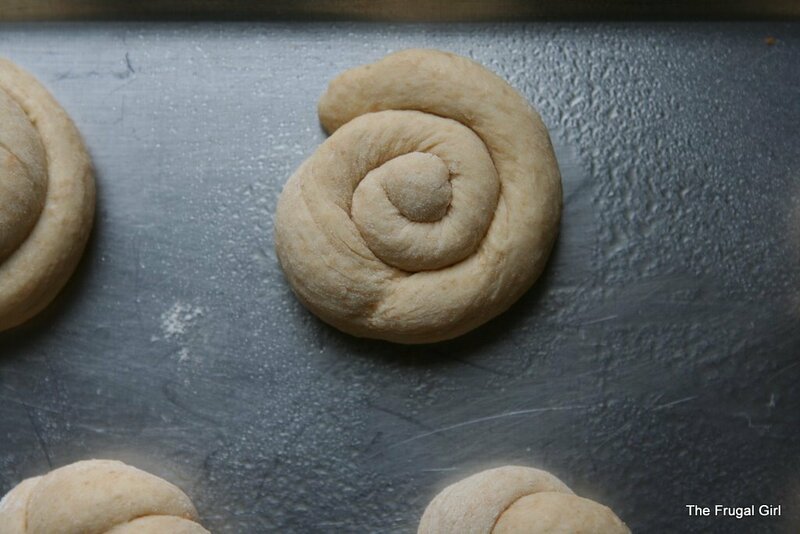 After watching my SIL gently, lovingly kneading dough make rolls at Christmas I realized I had been working with dough that was way too dry. I went looking for recipes with pictures…your website was just what I was seeking! I made these rolls today. The only intentional change was to add a scant 1/4 cup of honey…my family likes sweeeet rolls. The dough was a delight to work with. I put the dough to rise then realized I had forgotten to add the eggs! I finished them into rosettes and baked them. They are so pretty and they are delicious! Thanks so much! Totally late to the party, but I made these tonight! I made 8 sandwich-sized rolls for our lunches this week, and used olive oil instead of butter, water instead of milk, and only a teaspoon of sugar to help the yeast rise. Oh, and I added a few handfuls of mixed seeds! Brushed them with a bit of milk and sprinkled some more seeds on top – yum! Can’t wait for lunch, now. Thank you again for yet another amazing and wonderful recipe. You rock! I was searching for whole wheat roll recipes because my sister LOVES whole wheat breads and there are so many out there to choose from with good and bad mixed reviews that I decided to take a chance (based only on the fact that I love the pictures) and I am happy I did. These are so easy, light, delicious, with that perfect whole wheat flavor. I will say I was surprised at how much they rose!!! Beautiful and yummy. I am going to make loaves of bread using this recipe because it turned out so great. Thank you!!!! I’d use about a third of a cup. Can this recipe be cut in half? This would make six rolls instead of twelve. I don’t have a stand mixer and think this amount of flour would be too much for me to mix and knead by hand. I have a small family, too. Only three adults. Could the dough section just be rolled into one ball instead of three? I don’t need anything shaped that fancy. You could cut it in half, but honestly, it’s sometimes a little bit harder to knead a teeny amount of dough. And you can always freeze extra rolls! You can just shape them into one ball, yes. They’ll be less fancy, but they’ll work just fine. How much sugar does this recipe call for? There is just a black diamond with a question mark inside it where the amount for the sugar is supposed to be. Oh, nuts! That’s a formatting issues that happened during my hosting migration. I’ll notify them. For the meantime, it’s 1/2 cup, but you can use as little as 1/4 cup if you like. The printable version of the recipe is working fine, so you can print that and use it. I know I am commenting WAY late, but I wanted you to know that I have made these rolls several times and my family loves them! Thanks for the recipe. Late to the party but just wanted to share my love for these. Been baking them for many years and they’re akways a hit. I just make them into blobs. This cookbook alao has a perfect recipe for authentic pita bread!